Mini cakes (Φ14cm) are suitable for festive moments and celebrations with a couple of friends or family members, or as romantic gifts for lovers. 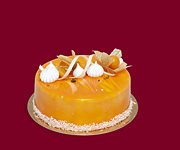 Mini cakes excel not only with their unusual taste but also with their beauty and elegance. The decorations in the following pictures can be changed according to seasons. Smooth cream with elderberry juice on vanilla corpus. 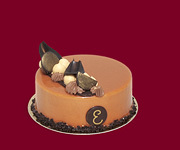 Belgique caramel chocolate with cream on chocolate corpus with crunchy nut chocolate.